Honing Machines from TAKEZAWA-SEIKI boosts the performance of reamers to the maximum. Deterioration of the machining accuracy due to the damage to the tools caused by chips, as well as galling or lack of stiffness in a machine tool, is a problem in reamer processing. TAKEZAWA-SEIKI develops machine tools that bring about the performance of a reamer by 100% to realize cylindrical grinding with higher dimensions in order to cater to the needs of various customers. 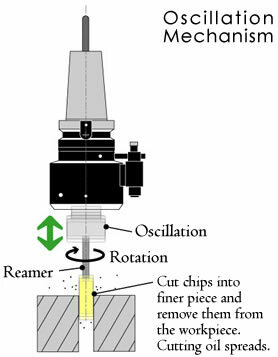 A reamer is vibrated to dice chips into finer pieces, and then, automatically expels them. This dramatically improves the aspects of surface roughness and tool life, while providing a honing process with ultrahigh precision. This is achieved using an oscillation mechanism, which prevents the galling of a tool by avoiding damage to the tool caused by chips. An easy-to-see, touch panel style operation box has been adopted to feature operations that is simple, even for beginners. Furthermore, the coolant device is built in the bed to conserve space. The fitting of mechanisms for supplying, conveying, and delivering makes it fully compatible for automation. 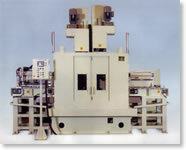 Various honing machines are available from TAKEZAWA-SEIKI. THL-05: An entry level model with a good balance between cost and function. TLB-20: A standard machine with a good balance between precision and cost. TKF-05:A compact machine with a small footprint that occupies one third of the space. Micron Holder: A holder for transforming general-purpose machines into honing machines. This is a case example of a customer who came to us for a consultation regarding the reamer processing of sintered metal with a hardness of 60 to be processed at a production rate of 30 s per hole, with a surface roughness of Ra 0.1 or less. To satisfy the stringent requirements of precision, we decided to start from the process design. From our considerations, we concluded that reamers from TAKEZAWA-SEIKI can complete the task in four processes. We then designed reamers to be optimized for each process before proceeding to develop honing machines suitable for each process. We were able to cater to the requirements of the customer by developing a fully automated processing line, equipped with a conveyor system and comprised of four honing machines based on the TKF-05, manufactured from TAKEZAWA-SEIKI. This case example was achieved because it was handled by TAKEZAWA-SEIKI, a company capable of designing boring processes, designing reamers, and developing honing machines. In this case example, a honing machine to be used for the final finishing process of spool holes for switching the valves of the construction machinery was developed. The customer not only required the machine to perform highly precise reaming on twelve holes for workpieces, but it was also required to perform detailed machining accuracy settings for the process and had to be done with a low cost design. It was possible for TAKEZAWA-SEIKI to satisfy such requirements and maintain low costs by creating a development based on the structures of the numerous honing machines that TAKEZAWA-SEIKI had already developed in the past. This resulted in the creation of an automated processing line that allows detailed settings for each hole, in response to the requirements of the customer. This is a case example in which we received a request from a customer who wanted to improve the precision in their semi-finishing process in order to shorten the honing time of their engine cylinders. Performing a highly precise semi-finishing process makes it possible to carry out super finishing with an even higher precision in a shorter period. The precision requirement was not very difficult for TAKEZAWA-SEIKI to fulfill, and by using a reamer and honing machine from TAKEZAWA-SEIKI, the whole procedure could be handled in two processes. The problems were that the processing bore diameter required a large caliber, measuring 100 mm, with a high-speed processing rate of 50 s per bore. Conventional honing machines were not capable of responding to such requirements. It was, therefore, necessary for us to develop a machine tool from scratch, and the result of this development is the honing machine depicted in the photograph on the rignt. This is a fully automated processing line, featuring a high-power motor of 3.7 kW mounted on a newly designed high rigidity frame, fitted with a conveyor system. Although this machine was based on the “TKF-30” honing machine from TAKEZAWA-SEIKI, it is a new machine that was re-done from scratch. TAKEZAWA-SEIKI willingly engages in the development of machine tools from scratch in order to fulfill the requirements of a customer. Numerous honing machines delivered by TAKEZAWA-SEIKI are currently operating at the sites of customers.